Artist Matt Glavin (1926- ) American Year Circa 1970 Medium: Water color with collage and pen Paper Strathmore museum board. 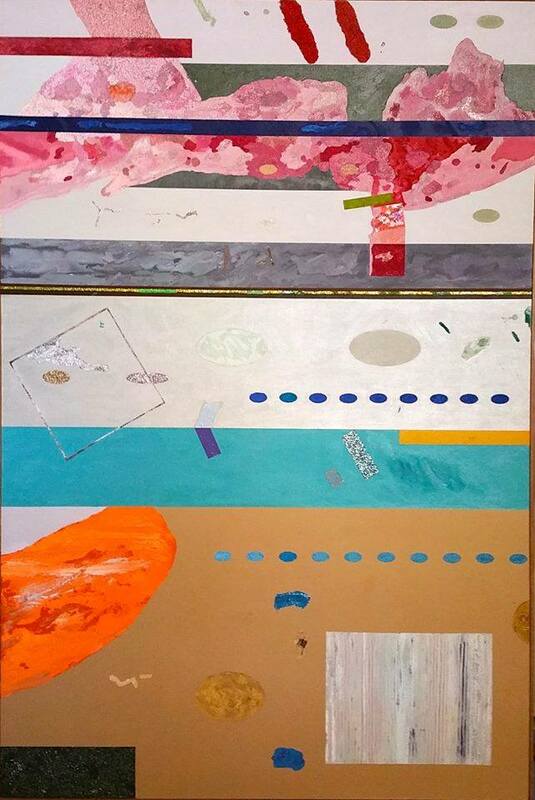 Size image: 30 x 30 inches Untitled #2 Farhat Art Museum Collection. Artist: Matt Glavin (1926- ) American Title Wake Of The Wake Dated: Year 1971 Medium Water color and collage Paper Strathmore museum board Size image: 30 x 30 inches Signature Signed in pencil, lower left and upper left Farhat Art Museum. 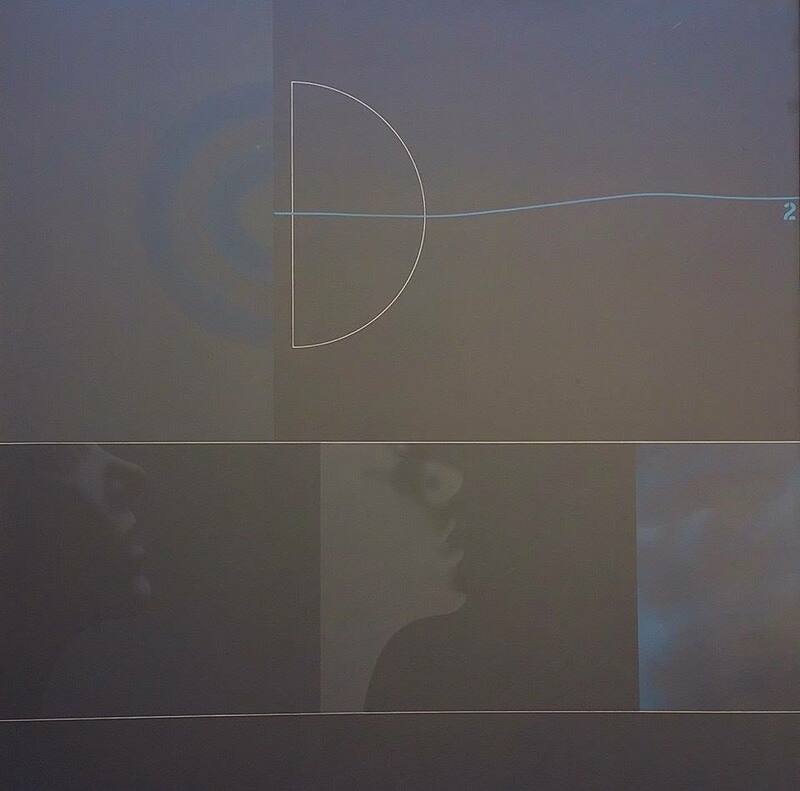 Artist: Michael Diven ( 1943- ) American Measures: 48 x 48 inches Air brush / Acrylic on Canvas Titled: Phase 4 # 16 and dated 1970 signed Diven on reverse. Farhat Art Museum Collection. 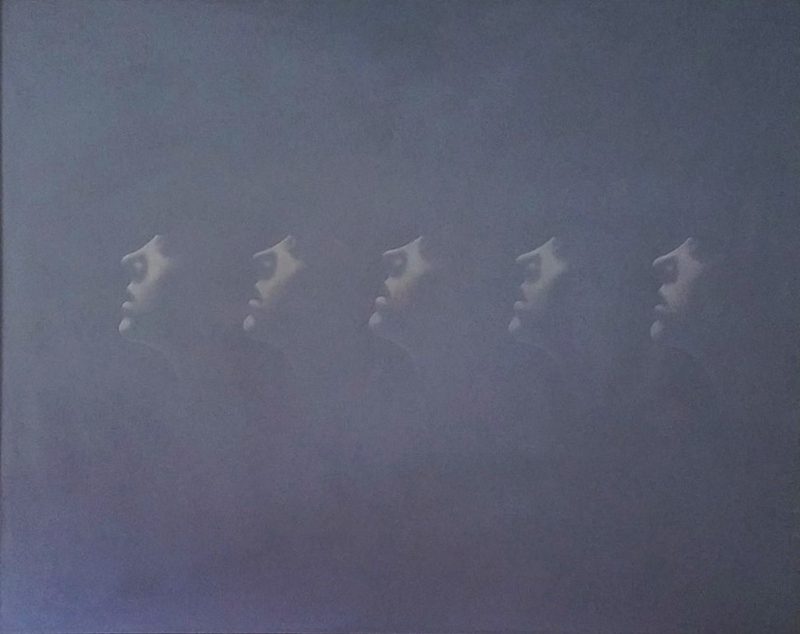 Artist: Michael Diven ( 1943- ) American Measures: 40 x 60 inches Air brush / Acrylic on Canvas Titled: phase 4 / # 28 and dated 1970 signed Diven on reverse. Exhibited at San Francisco Museum of arts 28-1971 Farhat Art Museum Collection. 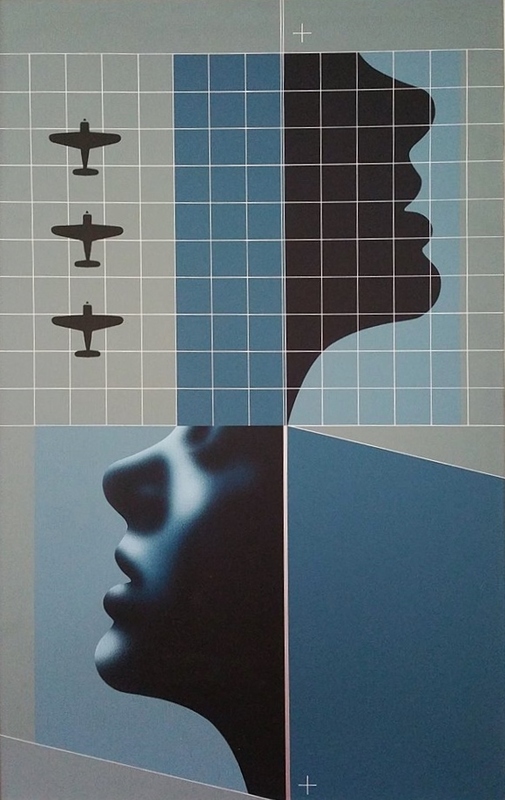 Artist: Michael Diven ( 1943- ) American Measures: 48 x 30 inches Air brush / Acrylic on Canvas Titled: phase 4 / # 10 and dated 1969 signed Diven on reverse. Farhat Art Museum Collection. I was born and raised in Utah where my high school art teacher inspired me to seriously pursue art. After high school I moved to Los Angeles, California, to attend art school, but instead, surfed and painted for the next few years. I later returned to school, studying art at the University of Nevada, Reno, and the San Francisco Art Institute, where I earned an MFA degree in painting. I taught painting and drawing for 15 years at several West Coast colleges and universities. Four years ago I moved from Northern California to the Philadelphia area. My art has been exhibited nationally in major galleries and museums and is included in numerous public and private collections. Works included in many private and public collections including: San Francisco Arts Commission, San Francisco Hall of Justice, People’s Bank of Seattle, May Collection, L.A., Freeman Ford Collection, Media Generalist’s, S.F., permanent collections at University of Montana, Missoula, Central Washington State University, Ellensburg, and University of Nevada, Reno. Private collections include James Snidle and Franco Mancini, San Francisco, Pat and Richard Macias, Maria Phillips, and the Museum of Northern California Art, Chico, CA, and Linda Welch, Portland, OR. Geoffrey Bowman was born with a keen intellect and a mind filled with curiosity about the world around him. As a consequence, Geoffrey led a richly varied life. During his lifetime he earned his living as a Navy sailor, insurance salesman, taxi cab driver, mail carrier, prison art teacher, SJSU professor, and as an artist. During that same lifetime Geoffrey seriously pursued and became intimately acquainted with the cooking and eating of good food, the calligraphy and spoken word of the Japanese language, growing tomatoes and eggplants, world history both ancient and modern, politics, bebop, opera, jazz, playing the tenor saxophone badly (Geoffrey felt that it was the only instrument that had a truly human musical voice), eastern philosophy, and above all his art, both printmaking and painting. Geoffrey was born in San Francisco 1928. He had fond memories of his frequent visits as a child to Golden Gate Park, including the Japanese Tea Garden and the DeYoung Museum, where he developed an early interest in Asian Art. In 1946, unhappy with high school–which included an obligatory half-day of factory work–Geoffrey quit school and joined the Navy. During this enlistment Geoffrey sailed to China, Korea, the Philippines, and Hawaii. The timing and intensity of this travel affected Geoffrey for the rest of his life. Two years later, after being discharged from the Navy, Geoffrey earned his high school equivalency diploma. Five years later Geoffrey met and married his first wife Mill, and graduated from San Francisco State University with a BA in Social Science. During this time he also became intensely interested in art and printmaking and began to study art formally. By 1957 Geoffrey had earned his graduate degree in art and began to teach art in San Quentin. At this time he was also beginning to be noticed in the art community of the Bay Area. In 1960 Geoffrey left his teaching job at San Quentin to spend more time working on his art. He also began an intensive investigation of I Ching and Asian philosophy at the American Academy of Asian Studies in San Francisco. During this time to support himself and his wife Geoffrey drove a taxi at night so that he could have his days free to work in the studio. A pivotal moment in Geoffrey’s life occurred when in 1964 he joined the art faculty at San Jose State University and moved to San Jose. Through his stature as an artist, his concern for his students, and his high technical ability as a printer he became a valued faculty member; and was promoted to full professor status in 1973. Geoffrey taught at SJSU for twenty-nine years, specializing in lithography and intaglio printmaking techniques. Geoffrey had the ability to present complex concepts and techniques with such skill that his students achieved a consistently high level of creative expression. The effectiveness of Geoffrey‚Äôs academic assignments are well documented. Simultaneously Geoffrey was deeply involved in his own work and had accumulated an impressive professional exhibition record. Geoffrey‚Äôs work was exhibited regionally, nationally, and internationally. Geoffrey is in several public permanent collections including the San Jose Museum of Art, San Francisco Museum of Art, Achenbach Foundation of Graphic Arts San Francisco, Lannan Foundation New York, and Crown Press Berkeley. In 1970 Geoffrey took a year sabbatical from teaching and spent a year in Japan. Indicative of his thorough and methodical attitude toward all elements in his life, Geoffrey prepared for this sabbatical with renewed extensive study of the history, philosophy, and language of that country. While there, he produced a limited edition book; each of which contained twenty hand-pulled prints. This book, titled ‚ÄòBook of Changes,‚Äô was published in co-operation with The University of Tokyo Press. After retiring from teaching in 1994 Geoffrey turned to painting as his primary mode of expression. Although there was a media shift he continued to focus on one subject: the consistency of change. The phenomenon of change ‚Äì transience ‚Äì it was a lifelong fascination for Geoffrey. To express these abstract concepts, over the years Geoffrey invented a highly personal and attractive abstract visual language ‚Äì his own visual syntax ‚Äì replete with eccentric forms and complex surfaces and patterns, which seem to be in constant flux, shifting with varied light sources and viewing angles. This he accomplished in part with combinations of paint and an assortment of reflective materials such as metallic flake and leaves, glass beads, and light-refracting pigments. Geoffrey became quite private in his later years and had his last one-man public exhibition in 2001 at the Fredrick Spratt Gallery in San Jose. Geoffrey Bowman was a gentleman, a scholar, and an artist; all those who knew him will miss him. Andreas Nottebohm was born in Eisenach, East Germany, on October 13, 1944. From 1965 to 1969, he studied at the Academy of Fine Arts in Munich, West Germany, under Professor Mac Zimmerman. 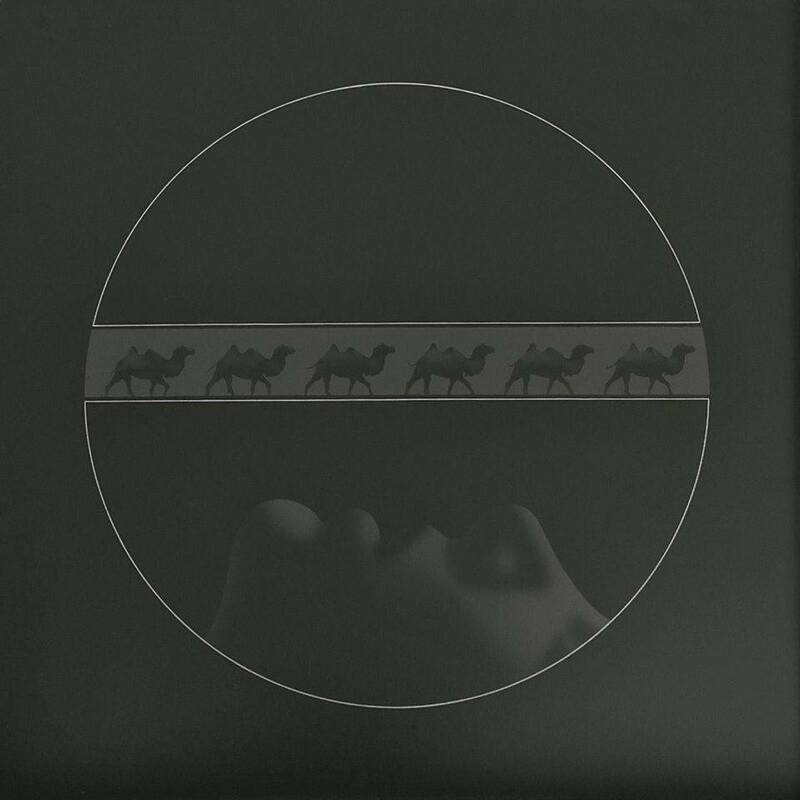 In 1968, he studied etching at J. Friedlander’s workshop in Paris, France. 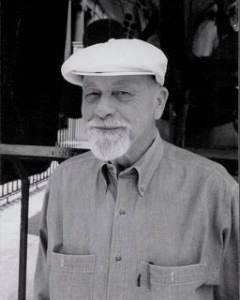 From 1971 to 1974, he studied lithography in Salzburg, Austria. He returned to Munich in 1974 and became a member of the Salzburg Group ’73 in 1975. In 1978, Mr. Nottebohm made his first visit to America for a one-man show with Gallery Hilger (Vienna) at WASH-ART in Washington, D.C. Since then, Andreas Nottebohm’s work has played a significant role in the world¹s recognition that our universe is a vital part of our environment. 1992 Assignment to document a night main engine test firing. 1991 Assignment to document the Virtual Reality Research activities at the NASA Ames Research Center in California. Selected as a member of a four person art team assigned by NASA to document space activities in the Soviet Union. Travels to Moscow and Baykonour (Kasachstan). 1990 Assignment to document launch and landing of the Space Shuttle Discovery (Hubble Space Telescope Mission). 1989 Assignment to document the Voyager II close encounter with Neptune. 1988 Assignment to attend the first launch after the Challenger accident. 1985 Painting of the first night launch included in a NASA release of ten lithographs presented as Selections from NASA Art Program . 1983 Assignment to attend first night launch of the Space Shuttle. Painting selected for the official poster for NASA’s 25th Anniversary celebration, Houston, Texas; artist in attendance. 1982 Assignment to attend the third launch of the Space Shuttle Columbia. 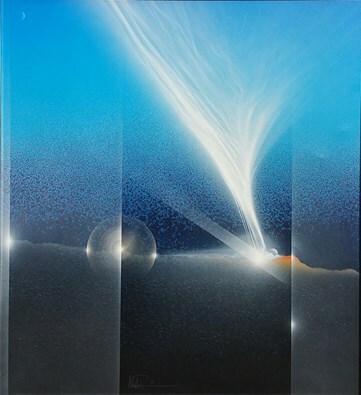 Painting selected from the NASA Art Collection for the official poster representing the United States at the United Nations Conference, “Peaceful Exploration of Space,” Vienna, Austria. 1981 Invitation to attend the launch of the space shuttle, Columbia, at Cape Canaveral. Assignment to attend the Close Encounter with Saturn, at the Jet Propulsion Laboratory in Pasadena, California. The death of traditional painting gets perennially exaggerated. But as it has proved time and time again, painting has more lives than a shut-in’s runaway litter of freeway darting felines. Even as nowadays, many conceptually-oriented contemporary painters are becoming more apt to paint with pixels rather than with traditional oils or acrylics, there is that occasional eccentric who manages to put a new and unabashedly low-tech spin or two on this messy indestructible medium as we delve deeper into the Digital Age. One such figure is German-born Bay Area-based Andreas Nottebohm whose recalcitrant, industrial-chic paintings on raw aluminum (and occasionally copper) hover evocatively halfway between painting and sculpture – resurrecting mid-60s fascination with “object-hood” even as they obliterate the minimalist’s obsession with order by cultivating the potential profundity of randomness. If these robust, shimmering, objects don’t exactly bring to mind those new-fangled gimmicky designer canvases that churn colorfully inside glowing LED monitors today, they nonetheless eschew easy pigeonholing and blithe classification, preferring instead to exist in a state of baroque, genre-blurring flux, wryly morphing into something dazzlingly new in effects that depend on how light strikes their reflective metallic surfaces. Here, we need to realize that Nottebohm’s brush is, in fact, a power sander-grinder that operates in a similar manner to a sculptor’s chisel. So it comes as little surprise that the resulting scraped, scratched, scumbled and pocked surfaces give rise to crater-like light traps. Fortunately, what emerges from this corrosive process usually rubs viewers the right way. Whereas geocentric Renaissance painters, with their minds and feet planted firmly on the ground under Newton’s apple tree, viewed their paintings as ‘windows onto the world’, Nottebohm refers to his paintings as ‘windows into the Universe’. Unlike a ‘timeless’ Renaissance painting depicting, say, a Madonna and Child in which the figures remain frozen in time, bound together in the familiar pyramidal composition – that most stable of shapes — Nottebohm’s universe marks the passage of time as the viewer’s shifting vantage point plays a pivotal role in bringing his paintings to life. 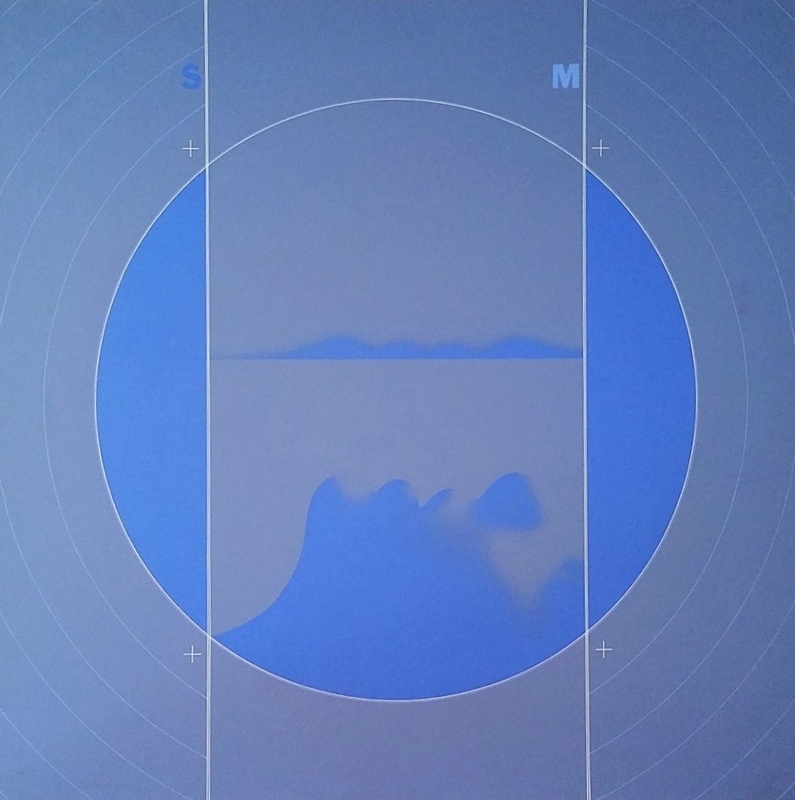 Indeed, the constituent -elements – here remain paradoxically, in flux and while some of his paintings appear at first glance to ostensibly border on the non-objective anchored to nothing, on further perusal allusions –or illusions– to art history and nature abound: Leonardo-esque sfumato (smoky mist), German Romanticist seascapes, Zen-flavored abstract expressionism offshoots, for a start. Before the direct use of color began leeching out of his paintings a few years ago, Nottebohm’s work was a phantasmagoric cornucopia whose colorful, light-soaked landscapes combined the terrestrial and the celestial – to boldly go where no painting has gone before, as it were: Luminous abstractions chock-full of black holes, worm holes, celestial orbs that doubled as an atom’s nucleus, gravity, and myriad Electro-magnetic radiation. One might expect to behold ribboned Aurora Borealis-es shooting up from craggy, primordial rock formations stretching across the horizon. Their incessant, bilateral symmetry, meanwhile, bring to mind trippy, acid-soaked George O’Keefes. In rendering the invisible visible, the artist seems to be saying that ‘reality’ – that most slippery of terms — is more magical and fantastic than we can possibly imagine. Perhaps this is why the artist considers himself a ‘realist’ painter rather than a simply an adroit creator of fantasyscapes or purveyor of psychedelic science fiction. A recent piece like the large buff silvery gray painting [Nottebohm prefers to leave his paintings untitled, playful quasi-scientific designations – KN-1686 or OP30 – sound like outtakes from the Elemental Table – designation 0P30 -] would fare equally well inside a dilapidated bomb-shelter or corporate lobby. While it might not rock the boats of most corporate movers and shakers, it’s smoke-ring sfumato, moody tenebrism, and broad circular swaths coalesce to suggest waves or some other natural tempest ala Turner’s 1843 Morning after the Deluge, and contribute to a decidedly neo-romantic aura. The aluminum ‘canvas’ calligraphic abstract field of marks and scratches, in turn, also locates it within the abstract expressionist realm. Another recent large painting (48″x48″) with its wriggling flurry of lines receding into the distance, is embedded with wiry rivers of molten light whose abstract rivulets of energy make it look as if the artist has laid bare an unending bio-electric circulatory system. This is a particularly good example of how the artist deftly conflates the subatomic, terrestrial and cosmic scales. Needless to say, Nottebohm’s art hovers at the interface of art and science on a number of fronts: The ghostly vapor trails and Zen-like wisps that dance across the buff surface of becoming and vanishing bring to mind elusive subatomic particles inside Donald Glaser’s bubble chamber. It’s little wonder that his art has received raves from the likes of people such as legendary science/fiction author Ray Bradbury (noted physicist Stephen Hawking owns a piece) For the past two decades, Nottebohm has literally been NASA’s poster child periodically called upon to document events. If some of the NASA poster commissions occasionally sputter operatically over the top, the best (i.e. more restrained) posters conjure up the sublime canvases of 19th century American landscape painter Frederick Edwin Church. As compelling as Nottebohm’s abstract energy fields can be when seen under natural (or artificial) illumination, the real magic takes place when the lights go down. Here, these monumental paintings’ fundamentally flat surfaces assume an added dimension as they morph into 3-D hologram blues that seems to hover tantalizingly just beneath the surface (akin to those glittering vodka ads in one might find in, say, TIME Magazine). I’ve long felt the holographic paintings would be a next step in the evolution of traditional painting. Perhaps Nottebohm will be seen as a pioneer in a field that has just begun to be mined. (Not surprisingly, light is the critical element that brings holograms to life. Viewed in a dark room with changing lighting, where icy blues give way to smoldering reds, the metallic tabula rasa generate something akin to a trippy video installation. The effect can be quite mesmerizing. Harry Roche is a Bay Area Based Art Critic and Curator at Large.